Ceiling drape is the elegant solution to your event decor needs. It’s cost-effectiveness makes it the easiest way to create a classy, upscale feel to your event. We only use the best-quality chiffon crafted specifically for draping ceilings. You can be sure that our ceiling drape designs will add to your event decor and not detract from it. We will custom design an arrangement to fit your events theme. With many kinds of fabric to choose from as well as colors we are sure to find a match to help complete your design. Each and every job is unique and important to us. We put our full effort into doing extensive research and planning before your event. The addition of ceiling drape to a room will help to solidify the look and feel of your event. But, it also serves a functional purpose as well. Ceiling drape can cover unsightly elements such as damaged ceilings and walls or any fixtures that can’t be removed. So don’t leave your ceilings bare. 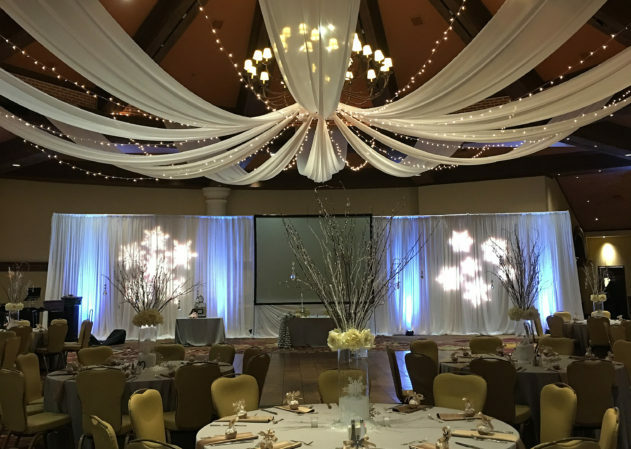 Complete your event decor with ceiling drape today!